This hoover vented tumble dryer from comes in a stylish white colour, it features a 8kg reverse action drum that stops your laundry becoming tangled up in the drying process, if you want to delay the start time this is a simple process thanks to the 9 hour timer delay, and it comes complete with the most useful addition to modern dryers, a sensor drying function, that senses when your clothes are dry enough and stops – saving you money over the years of it’s operation. This Hoover vented tumble dryer combines stylish design with practical functionality. The large drying capacity and excellent features make it perfect for larger families. 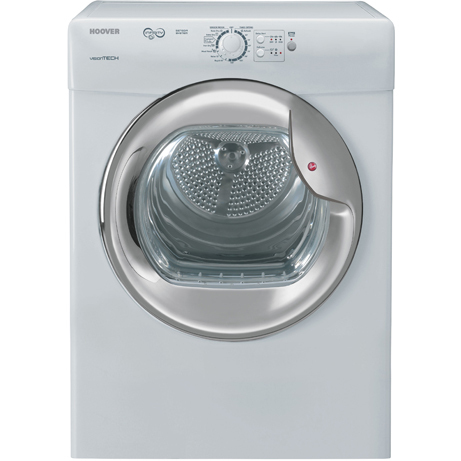 Supplied with a vent hose, this tumble dryer offers great drying performance. The excess moisture is vented outside your home, so you don’t have to empty a reservoir after a drying session. Just make sure you locate the appliance near to a vent or window. With such unpredictable weather, it can be difficult to get all your laundry dry outside. However, this Hoover ensures you get everything dried exactly when you need. This tumble dryer offers a large, 8kg drying capacity to get your piles of damp laundry ready to wear again in no time. The larger capacity also means it can dry bulkier items such as bed sheets more easily. Can’t decide which programme to pick? This comes with four sensor dry programmes, which dry your clothes to a level you select. Keeping your appliance in top condition is important to get the most out of it. Hoover have made this easier with this model as it has a filter care indicator. This lets you know when the filter is full and needs emptying, meaning your tumble dryer will always perform at its best. With its attractive white finish and chrome glass door, this machine from Hoover is an eye-catching appliance. With its large capacity and easy to use features, this Hoover tumble dryer is a great appliance for any family home.